It's a wonderful museum, no doubt about it. Stuttgart is in the center of what used to be the Celtic culture in South Germany, and at the edge of that part of present day Germany that was occupied by the Romans. It is also close to the "Schwäbische Alb", the caves of which hold humankind's oldest pieces of art, and so on. Stuttgart is also one of the richest cities in Germany, holding the headquarter of companies like Mercedes, Porsche, Bosch, and so on. Not to forget, it contains one of the best operas in Germany and thus of the world, and it is growing wine. The museum is huge (it used to be the castle / palais of the dukes / kings of Württemberg). 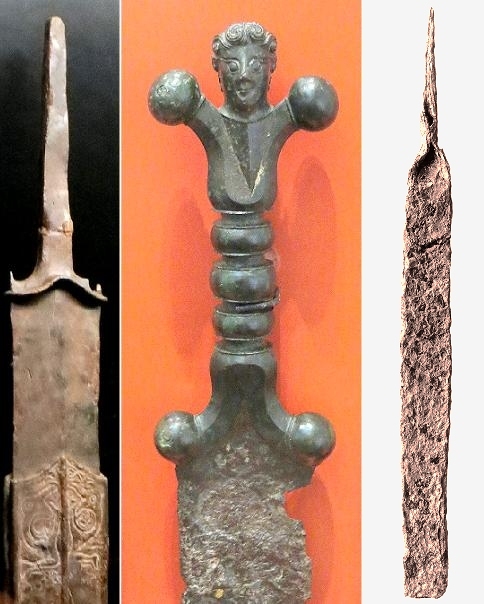 As far as iron artifacts are concerned, it has a lot of Celtic things (see below) and a lot of pattern-welded Alemanni swords from about 400 BC - 800 BC. Major finds come right from the area I grew up in. 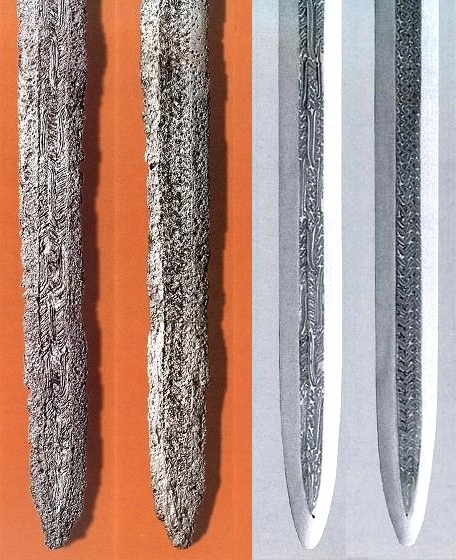 Pleidelsheim Sword; front and back. Source: From Manfred Sachse's wonderful book; with friendly permission. Now (Dec. 2012) it's worse. Only a few swords are displayed in small glass cases and illuminated by spot lights, making viewing difficult and photography almost impossible because of reflections. There are now several replicas of pattern-welded swords - but no explanations whatsoever. Let's hope that things will improve after the closure of the big special exhibition about the Celts (see below). 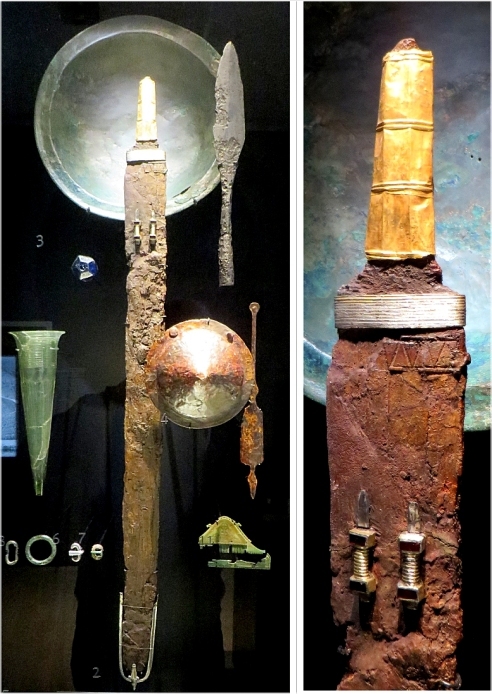 In particular, it remains rather unclear how iron / steel technology has developed between the fading of the Celtic dominance in the first century AD (the Romans moved in and stayed for a few centuries) and the appearance of extremely complex pattern-welded swords around 400 AD - 800 AD. The Celtic swords between 500 BC and 0 AD, while quite good and therefore a successful export items found all over Europe and elsewhere, were much simpler. I doubt not that somebody somewhere and sometime has written learned treatises about that. I'm only saying that in the central museum for this kind of stuff you can't learn anything about this. 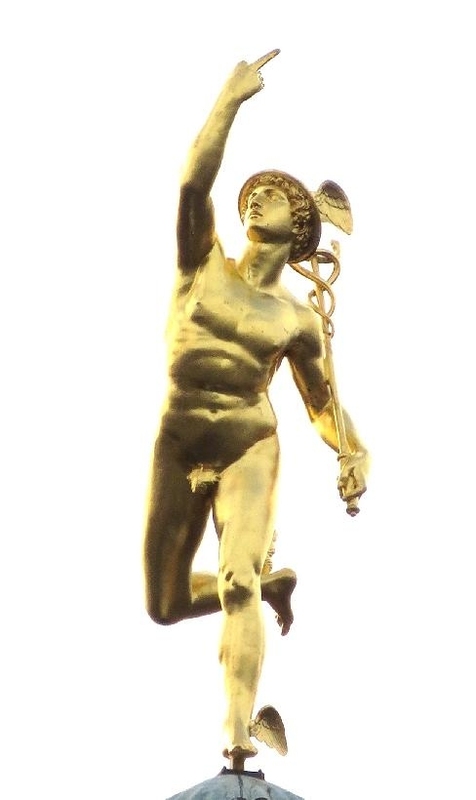 Hermes, on top of a tall column on Schillerplatz, Stuttgart, directly next to the museum, comments the "Special Exhibition Dedicated to the Celts". Intentionally destroyed Celtic (Hallstatt) sword in perfect condition. Many metal swords / metal objects were not well displayed. Unfortunately the Stuttgart people suffered from he presently virulent "keep-things-in-the-dark disease": Very dark rooms; some objects illuminated by spot lights. For metal objects that means that you either see next to nothing or reflections. The texts were generally too simplified or just wrong. The words "iron" and "steel" were used as synonyms, smelting and melting was confused (as usual), and then there were several gems like: "made from a bronze - tin alloy". As a positive point, there is a book: Die Welt der Kelten, Thorbecke Verlag, 2012. It is somewhat better as far as metals are concerned but not really good. Those swords are completely different from the normal Celtic swords. They look a lot like rapiers, and they must have been intended for stabbing only. Reading the book it becomes clear that these weapons are a mystery - but why not say so in the exhibition? There you could hardly see those swords, and it goes without saying that no explanation of any kind was given. I visited a small part of the museum again in Dec. 2015. The new Celtic section, due to open sometime in 2015, was still closed but "Stone age" to "Romans" had been re-done and was open. The new exhibit is a big improvement; even the lighting is not as bad as I expected. 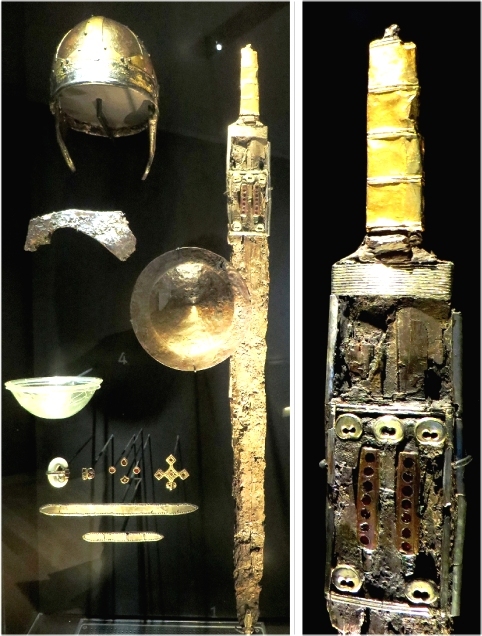 The museum did suffer from a case of the of the "keep-things-in-the-dark disease", see the description of the Special Exhibition Dedicated to the Celts given right above, but recovered to some extent and most of the items on display can be seen rather well. Taking pictures (without a flash of course) is also allowed by now and the only problem comes from the reflections caused by the glass cases. 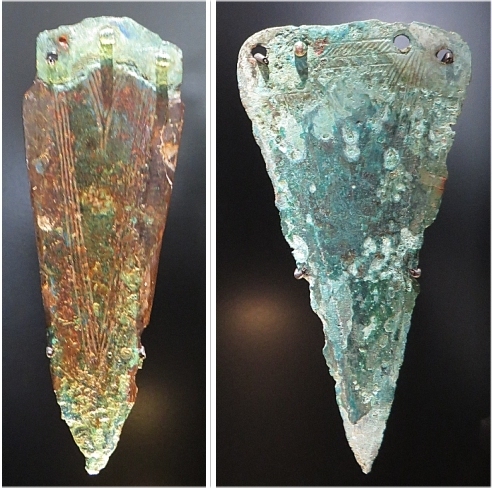 Copper (left) and bronze (right) dagger blades from graves around Aldingen. There are many interesting objects in the Museum; and despite my critical viewpoint given above, you should definitely go there. Plan half a day at least. You find, for example. 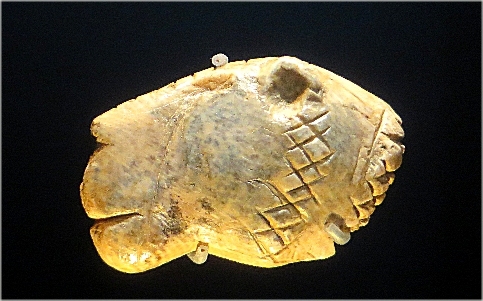 some of the oldest human art work like the lion below or the things alluded to before. 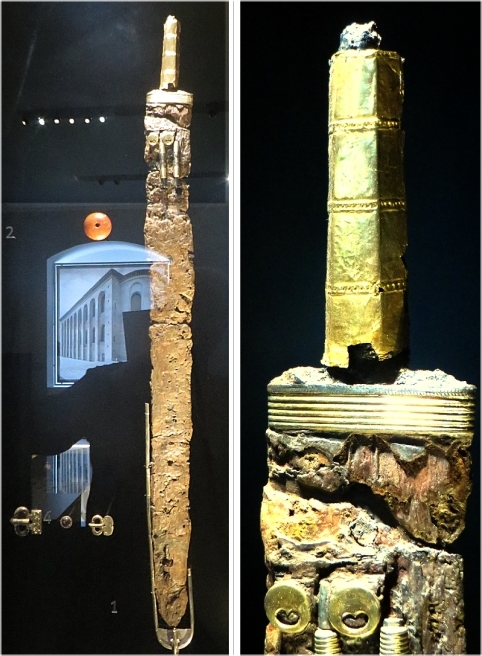 But I will not go into all the other intersting stuff (including wonderful altars from th middle age) except for the Alemanni "Gold hilt spatha". The museum shows four of them together with everything else found in the graves. The next two ones are from Gültlingen. The first one comes form a particular rich grave (it contained a "gold helmet!). The museum thinks that the sword, helmet and the gold / garnet cloisonné belt parts were made in the Byzantine empire. I'm not so sure about the sword blade, though. 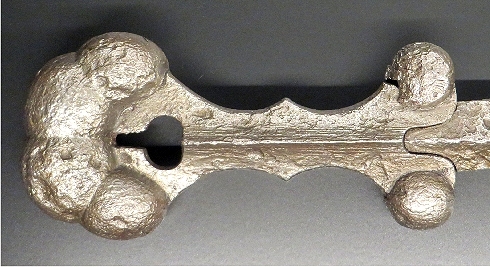 The fourth and last gold-hilt spatha was found in Pleidelsheim and dates to the end of the 5th century. It comes from a relatively poor grave and the gold only covers the "showy" side of the hilt (like some of the pothers). 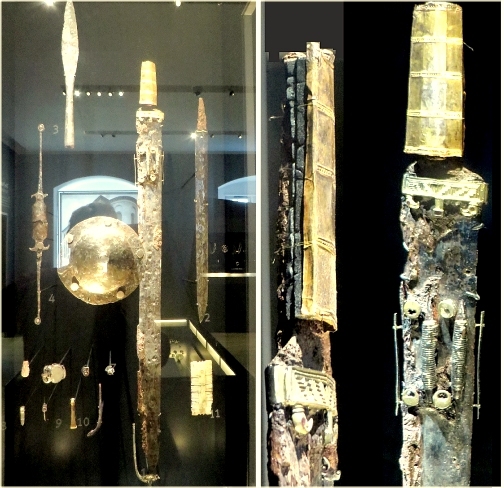 Gold hilt spatha and more from Pleidelsheim; recently found (and dated to about the end of the 5th century AD. Don't miss the museum if you ever make it to Stuttgart! In Dec. 2018 I visited the special exhibition "Faszination Schwert" and experienced a pleasant surprise: It was very good! No comparison to the earlier special exhibition about the Celts (see above). Well, before I get carried away, there are a few annoying points to report: Photography is not allowed, and still a few traces of the keep-things-in-the-dark disease will be found. But otherwise you find a competent and comprehensive show of all the factors that make European swords so fascinating. 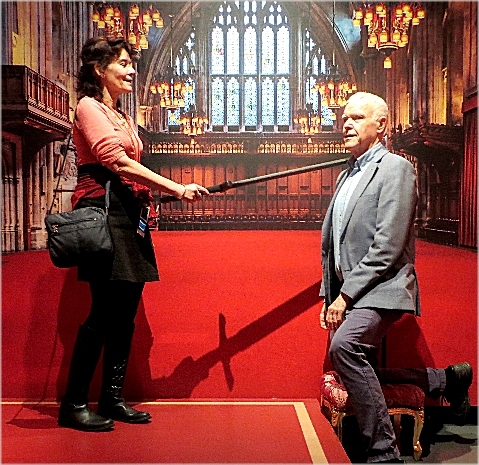 The museum wisely restricted itself to essentially European swords, of which it has a large collection. It says so explicitly and even shows some of the swords it will not cover - like Japanese nihontos, scimitars, wootz swords, etc. That puts limits on the discussion on many aspects of swords - from the metallurgy to all the symbolism - but allows the normal visitor to stay focussed on key items. Swords and women. A bit surprising, perhaps, but 7 out of 15 authors of the booklet are women and so are 53 out of 84 listed coworkers. 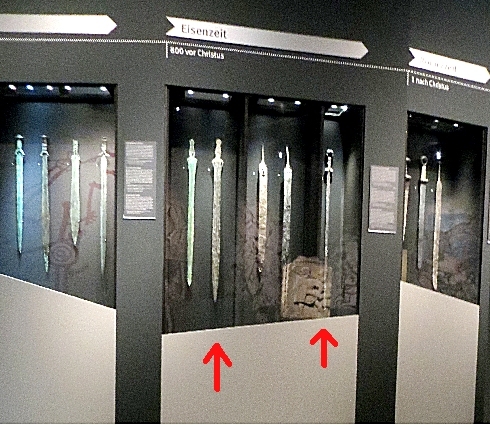 The arrows mark two very remarkable swords, a Celtic "Knollenknaufschwert"
No confusion of smelting ("Verhütten") and melting ("schmelzen"); possibly a first in museum exhibits. Faggoting is invoked and (correctly) explained. Definitely a first for museums. Ulfberht swords are shown and explained - rather well and without the usual hype about super weapons made from wootz steel. Some rather interesting and unique swords are shown. Things like pattern realization by etching or ("Japanese") polishing are mentioned and illustrated by (badly illuminated) samples . The first iron swords mimicked their bronze colleagues. It's what one would expect and we have seen that before. 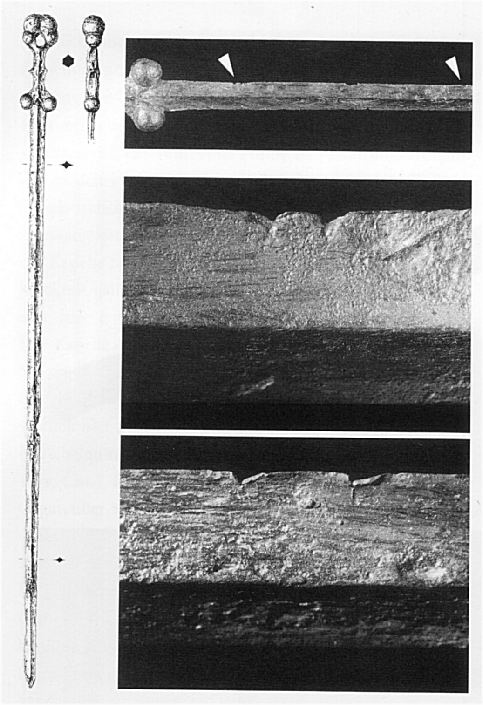 The sword is in perfect condition - but has never been investigated (at least there is no mention of metallurgical insights). 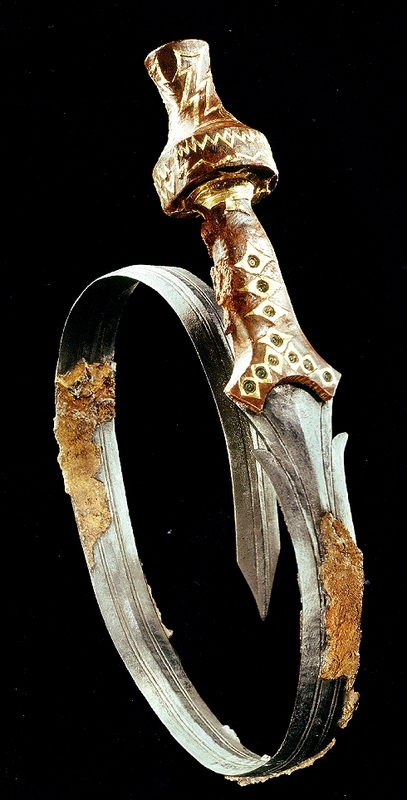 It is very similar to the also perfect (if bend) Celtic sword from Oss in Holland. It belongs in the category "Early Iron Swords", meaning that ther are practically no iron objects of this complexity that are much older. It would be prime interest to learn something about this sword, e.g. if its steel was faggoted like its relative from Singen. The book going with the exhibition is remarkably small - just about 100 pages. It is for the general public, well written and easy to read. It does not include some of the fine points from the exhibition, which is a bit disappointing for strange customers like me. You definitely should see this exhibition! 1) "Faszination Schwert"; Sonderausstellung Landesmuseum Württemberg, 10.2018 - 4.2019, in: Archäologie in Deutschlamd, Jahrgang 02/2018, Sonderheft 14/2018.